RayBio® C-Series Human Inflammation Antibody Array 1 Kit. Detects 20 Human Inflammatory Factors. Suitable for all liquid sample types. RayBio® C-Series Human Inflammation Antibody Array 2 Kit. Detects 20 Human Inflammatory Factors. Suitable for all liquid sample types. 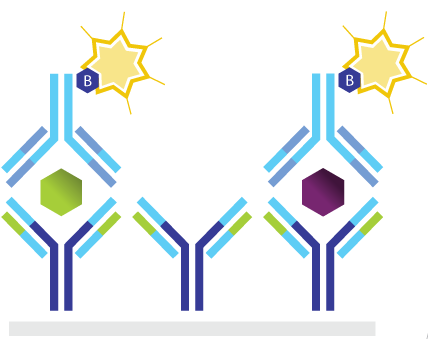 RayBio® C-Series Human Inflammation Antibody Array 3 Kit. Detects 40 Human Inflammatory Factors. Suitable for all liquid sample types. RayBio® C-Series Mouse Inflammation Antibody Array 1 Kit. Detects 40 Mouse Inflammatory Factors. Suitable for all liquid sample types. RayBio® C-Series Canine Inflammation Antibody Array 1 Kit. Detects 20 Canine Inflammatory Factors. Suitable for all liquid sample types. 5-7 business day lead time. RayBio® C-Series Bovine Inflammation Antibody Array 1 Kit. Detects 16 Bovine Inflammatory Factors. Suitable for all liquid sample types. 5-7 business day lead time. RayBio® C-Series Porcine Inflammation Array C1 Kit. Detects 26 Porcine Inflammation factors. Suitable for all liquid sample types. Excel-based data analysis software specific for Human Inflammation Array C1. Excel-based data analysis software specific for Human Inflammation Array C2. Excel-based data analysis software specific for Human Inflammation Array C3.